Called “failed stars,” brown dwarfs form with insufficient mass to fuse hydrogen into helium in their cores — a process that defines a star. But these objects aren’t planets either. Instead, brown dwarfs bridge the gap between stars and planets and have masses at least 14 but no more than 80 times that of Jupiter. Brown dwarfs slowly radiate the heat they were born with, which glows in infrared. Astronomers thus use infrared-detecting telescopes to find and examine these celestial bodies. Two studies reported in January discuss observations of these objects and focus on their changing weather. One, announced January 7 at the American Astronomical Society meeting in Washington, D.C., concludes that most brown dwarfs have turbulent storm systems. The scientists monitored 44 brown dwarfs for 20 hours each with NASA’s Spitzer Space Telescope to track brightness variations. Half of the objects exhibited such changes. “As the brown dwarfs spin on their axis, the alternation of what we think are cloud-free and cloudy regions produces a periodic brightness variation that we can observe,” describes co-author Stanimir Metchev of Western University in Ontario, Canada. “These are signs of patchiness in the cloud cover” . But due to random orientations, argue the astronomers, most of those 44 brown dwarfs probably have turbulent weather patterns, and only those 20 orient in such a way that Spitzer could see atmospheric changes. The other study appeared in the January 30 issue of Nature. 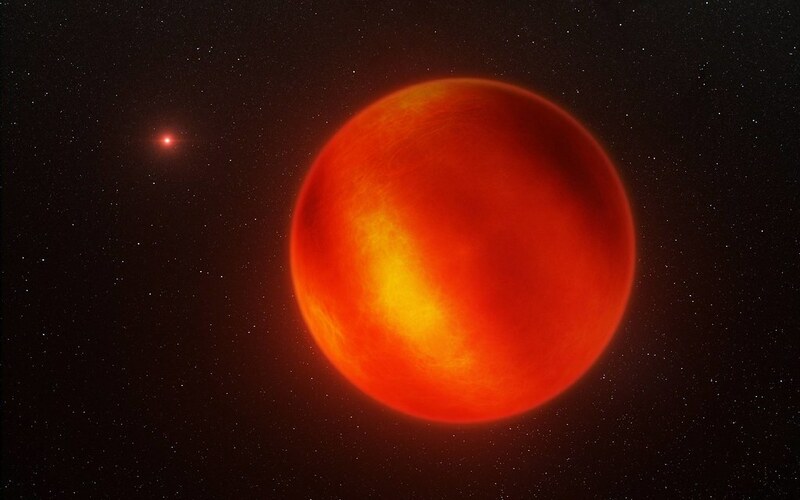 Ian Crossfield of the Max Planck Institute for Astronomy in Heidelberg, Germany, and colleagues observed the two closest brown dwarfs to Earth — WISE J104915.57-531906.1AB (also known as Luhman 16A and 16B). At just 6.5 lightyears from us, the pair is bright enough for astronomers to study in detail. Crossfield’s team used a spectrograph attached to one of the units of the Very Large Telescope array to break apart the light from five-hour observations of both brown dwarfs. Because Luhman 16B’s rotation period is 4.9 hours, the scientists could detect brightness variations across a full rotation. Luhman 16A, they say, rotates slower than its sibling if their spin axes are aligned. Crossfield and colleagues focused on one specific molecule in the brown dwarfs’ atmospheres — carbon monoxide — and tracked how this material moved throughout them. The astronomers identified bright and dark features on Luhman 16B, which they suggest are global patchy clouds. Crossfield’s team says the bright areas are regions with less cloud cover and thus let more of the brown dwarf ’s interior heat through; the dark areas are regions with thicker cloud cover and therefore are cooler. The scientists interpret these brightness changes and cloud cover as part of atmospheric weather patterns, and they used these observations to create the first weather map of the brown dwarf. Crossfield and colleagues suggest followup observations of additional molecule tracers in the atmosphere to see if they’re mapping changes in temperature, cloud properties, or differences in carbon monoxide abundances across the globe. Fast facts: Unexpectedly bright galaxies found in the early universeUsing NASA’s Hubble and Spitzer space telescopes, astronomers have identified four unusually bright young galaxies in the early universe. The deep survey image shows these objects as they appeared just 500 million years after the Big Bang; surprisingly, they are about 10 to 20 times more luminous than any such stellar conglomeration observed before. Their brilliance comes from active star formation, with one producing stars at a pace about 50 times faster than our galaxy does today. For the first time, the astronomers also were able to determine such a distant object’s mass: Although only some 3 percent the diameter of the Milky Way, each of these galaxies is likely home to around a billion stars.